We’ve all been there. You’ve planted some beautiful herbs, diligently cut and used them all summer long. But it got a little colder outside…kids went (back) to school… you went on vacation…you stopped using your backyard because your friends hosted better parties. I get it. I too fall into some of these categories- your herbs have turned into to woody, flowery messes. Do not fear! 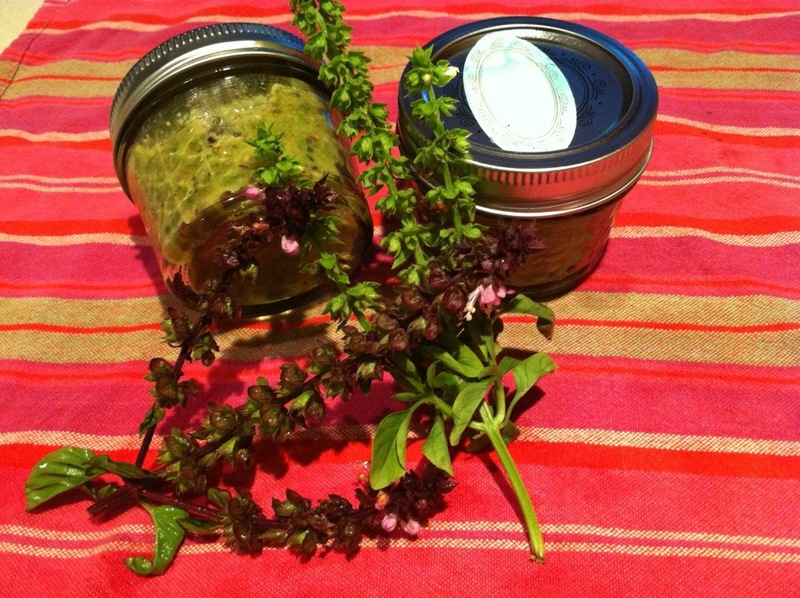 You can do something with the flowery tops of the herbs that we were always taught to distain and snap off. Make pesto of course! 2-3 large handfuls of flower stalks. I supplemented my supply by bartering some of my jelly for stalks at my local farm stand. This also allowed me to get a variety of herb flowers. I used basil, Thai basil, lemon verbena and savory. Add oil, flowers without the stalks, garlic, lemon- all the ingredients. Using a cusinart or blender Pulse on low until blended. Taste and add more salt/lemon if necessary. We had this on sandwiches for dinner. It was great as a extra special condiment! Did you process these jars? Or just keep them in the fridge? Sounds amazing! And great use of the flowers! I processed the jars to sterilize but didn’t process to seal. I wasn’t sure if the herbs would stand up to the heat AND pesto never lasts more than a week in our fridge! Have you had any luck processing pesto?